Rachel Fryer, piano; Paul Gregory, guitar; Jenny Broome, harp and Esther Ward-Caddle, cello. rec. St. Peter�s Church, Bexhill Old Town, Sussex. 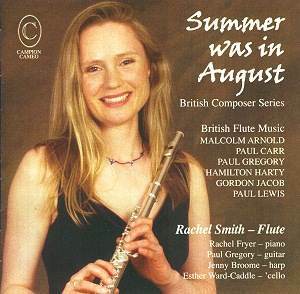 The first thing to say about this good CD is that it fills in a few gaps in the repertoire - not only of flute music in particular but of English music in general. I was absolutely delighted when I first saw the track-listing to see a couple of desiderata as well as an old favourite in a new guise. And let us not forget a number of works that are, I imagine, new to most listeners. But the opening number is one of Sir Malcolm Arnold�s most attractive chamber works. The Sonatina for Flute and Piano Op.19 was composed in 1948 for Arnold�s friend Richard Adeney. It is a strange work in many ways: in some senses it is hardly even a sonatina. There is too much angst in some passages for it to pass muster as a light hearted or �simple� work. The harsh chords in the opening movement and the somewhat despairing slow movement have all the hallmarks of a troubled mind and have the depth of a full-blown sonata. Yet the last movement is the gem of the piece. Someone once said that you could lick the ice cream off it: an absolutely gorgeous tune beguiles even the most stressed soul. Perhaps the only fault of this work is the range of emotion that it covers in such a short time-scale. Yet it is probably the masterpiece on this CD. Two works that I seem to have known about for many years are Gordon Jacob�s �On a Summer Evening� written for flute and piano and his The Pied Piper scored for solo flute and solo piccolo. Yet somehow I have never managed to hear either of these two pieces. The Pied Piper was composed in 1958 and well describes two scenes from the perennial fairy tale. The first is the �Spell� which seems to gives us the very tune that the Piper of Hamelin actually played to enchant the children away from their ungrateful parents. But then the soloist takes up the piccolo to play the eerie March to the River Weser. This is an attractive piece that could well be a fine introduction to chamber music for children. The short �vignette� �On a Summer Evening� is absolutely everything one could wish for � except that it would be longer. It is, as the programme notes state, an idealized view of that particular season. And the irony of this is that it was composed on a cold January day in 1975. It certainly evoked a number of lovely romantic thoughts in my head as I listened to this on an equally cold February Sunday in 2006! A number of years ago I reviewed the Naxos edition of Hamilton Harty�s great Irish Symphony. Sir Hamilton Harty:Irish Symphony Coupled on this disc with the Symphony and With the Wild Geese was the delicious In Ireland. I noted there that the composer had originally composed this work for flute and piano in the last year of the Great War. However I have never heard this arrangement before or since. The orchestral version was made in 1935. The score of the chamber version is prefaced by a short note: - "In a Dublin street at dusk two wandering street musicians are playing." The whole piece is to be regarded as the kind of improvisation beloved of the Irish. Yet the truth is more prosaic. It is an extremely well conceived and structured piece of music. The piece oscillates between moods of gayness and sadness. Of course the Irish-ness of this music is never far away: jigs and laments jostle each other for supremacy. I noted earlier that this piece had little to do with �busking� � it is far too subtle and intimate for that. The programme notes say that it may have originally been conceived for flute and harp � but the complexity of the harp part led Harty to publish it with a piano part instead. It is nice to hear it in what may have been the composer�s original intention. The remainder of the CD is devoted to a number of works by three composers whose names may not be quite as familiar to listeners as the three mentioned above. Each of them has contributed one or more attractive works for flute and either guitar, harp, cello or piano. Paul Lewis is better known perhaps as a writer of television music � with credits such as the Benny Hill Show Waltz. On the other hand, recent years have seen him concentrate on works for the concert hall. For example, the Norfolk Idyll is based on earlier television scores but designed for the recital room. However, attractive as the music is, it leads one to believe that an episode of some 1930s detective series is about to commence. The Pavane is a reworking of an organ prelude for flute, piano and cello. The sounds are quite ravishing, but the piece lacks content. Once again this is TV music. Perhaps the composer�s concert hall credentials are saved by the interesting and difficult Flute Diversions. Three short movements articulate the composer�s thoughts about three different types of flute. They were written specifically for Rachel Smith. The first is a flourish for the �normal� instrument, the second is scored for alto flute and the last is for piccolo. Paul Lewis�s last contribution is an evocation to the god Pan. Two of this deity�s moods are considered � Pan Thoughtful and Pan Playful. Both are scored for solo flute. One thought - with these solo flute works there is always the danger that we make a comparison with Debussy�s Syrinx. Perhaps this is no bad thing. The CD title track is from a three movement suite by Paul Carr. �Summer was in August� was a little bit of a disappointment to me: and I do not know really why �perhaps the promising title did not quite fulfil its promise. Notwithstanding, it is an attractively written work that exploits the skill of the soloist. The music is full of good tunes and well written accompaniment. Perhaps it is because I feel that the piece evokes some wistful costume drama about some crisis in a country house. It is not quite �To the Manor Born,� but getting pretty close. Carr�s other piece on this CD is the well written Three Pieces Blue. These are three contrasting movements that view the colour from Light Powder to Soft Violet by way of Dark almost purple. Great mood music! There does seem to be a thing about the colour �blue� on this CD. Paul Gregory�s contribution is a Sonatina for flute and guitar subtitled �Blue.� This time it is perhaps nodding to the �blues� as opposed to the �hues�. Not my favourite piece on this CD I have to say � it did not manage to hold my interest. This is a very good CD. The playing is faultless. It is useful to introduce works by a newer generation of composers alongside those of more established masters. My only caveat would be that many of the �newer� pieces lack distinctive character. Too often they seem like music designed specifically for TV. That may or may not be a fair criticism but certainly none of the �later' works have the depth and passion and delight of Arnold�s great Sonatina. Please do not listen to this CD end to end: select a few tracks. Otherwise there is a grave danger of the entire disc washing over you as one very long and indistinct Suite!